Phuket is an island located to the southwest of Thailand, on the Andaman Sea. It is one of the main tourist poles in Thailand and one of the most important beach destinations in Asia. 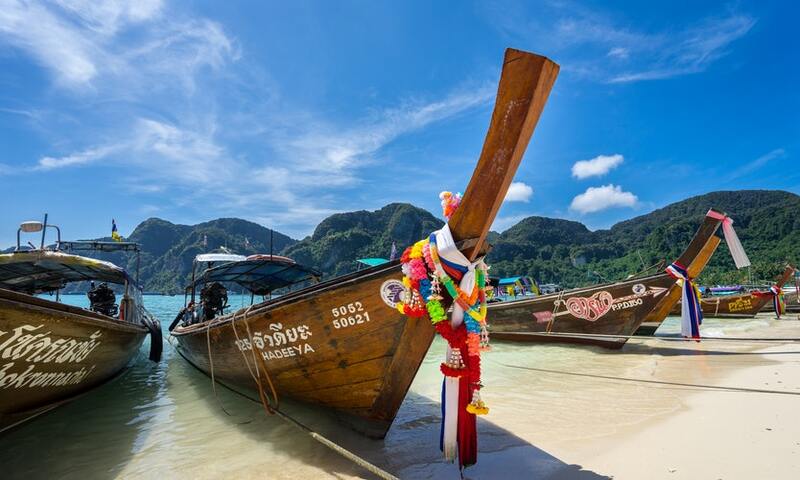 Phuket offers endless options as a tourist destination and some of the best beaches in Asia and the world. This great island offers cultural opportunities, nightlife and a glimpse of traditional life in Thailand. Phuket is the largest island in Thailand and has a wealth of beautiful beaches. Phuket has a tropical climate. The best time to visit Phuket is between December and March, the coolest season when the water is blue, transparent and calm. April to March is the hottest time of the year and September to November brings the monsoon season, with constant torrential rains and a stifling heat. You can get to Phuket from anywhere in Thailand, Asia and some European and Middle Eastern cities, as it has a busy international airport. To move around the island or between Phuket and Krabi province you can use the bus or the ferry. For internal mobility, the best option is renting a motorcycle, using taxis or tuk-tuk. When it comes to accommodation, to enjoy the paradise beaches of Phuket there are plenty of options. The island offers backpackers accommodation at very low prices, and even the most luxurious hotels are quite cheap in this island. A 4 or 5-star beachfront resort can cost as little as about US$30 per night. See all accommodation in Phuket. This is a guide with the best towns and beaches to stay in Phuket, Thailand. 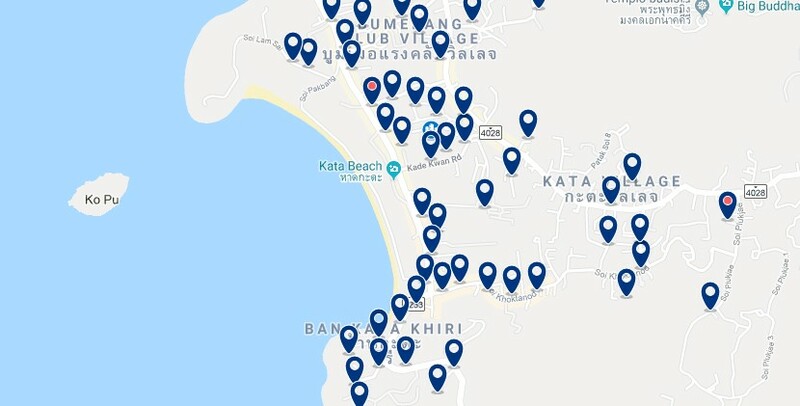 The best hotels all around Phuket Phuket. Hostels and cheap stays in several Phuket towns. Would you like independence? Book a Phuket apartment. Gesthouses, bed and breakfasts and pensions in Phuket. Phuket Town, also known as Phuket City, is the capital and largest city on the island of Phuket. Phuket Town stands out for its architecture. In its outskirts, the city is more modern and more traditional and provincial in its city center. Its most representative street is Thalang Road, full of shops and nineteenth-century buildings with typical Sino-Portuguese architecture. 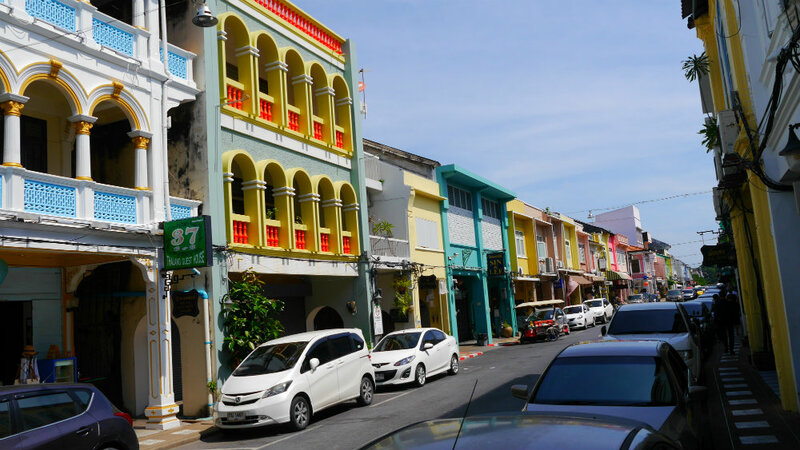 Although Phuket Town does not have a beach, it is a great option because of its history, tradition and the variety of its urban attractions that make it a pleasant place to stay in Phuket. Its sumptuous temples, restaurants, modern cafes and souvenir shops make it one of the main tourist attractions of the island. This city offers hotels of all categories, you can get accommodation at really low costs, boutique backpacker hostels, or luxury options with a pool. Phuket 346 Guest House, located in the old part of the city of Phuket, offers Sino-Portuguese architecture, comfortable rooms and a modern art gallery. It has a tour desk and free Wi-Fi. – from US$30. Sino Inn Phuket Hotel is only a 10-minute drive from the historic center of Phuket and offers elegant rooms and dormitories with air conditioning and free Wi-Fi. In addition, it has a tour desk. – from US$14. Rang Hill Residence is located in Phuket Town, a 7-minute walk from Chinpracha House Museum, it features an outdoor pool and free WiFi. The property is 900 meters from the Thai Hua Museum and 1.1 km from Phuket Old Town.. – from US$23. The Nchantra Pool Suite Phuket is a 5-minute drive from Rassada Pier and features a pool, a tour desk, a 24-hour front desk and free Wi-Fi in all areas. – from US$130 . 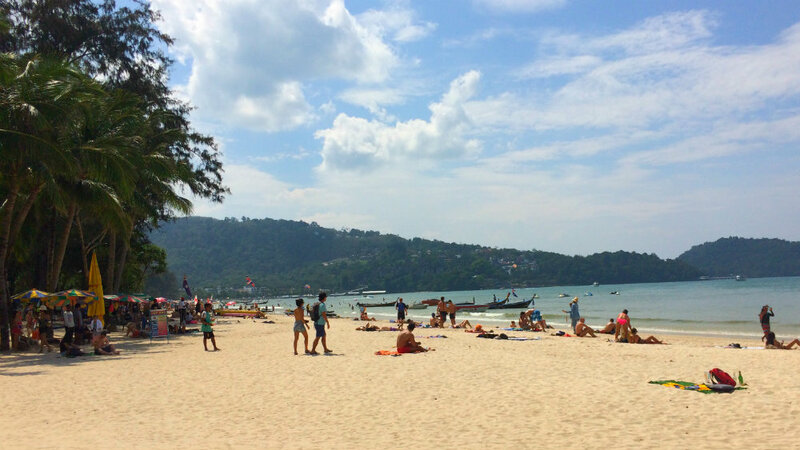 Patong Beach is one of the most popular places to stay in Phuket. Patong is the party capital of Phuket, and although its beach is nothing spectacular, most tourists who stay here do so to enjoy this peculiar beach town’s the legendary nightlife. Patong is a beach city full of day and nightlife, its streets always look full of tourists who flock there for its leisure options: shopping centers, bars, clubs, hotels, and restaurants. Patong Beach is about 50 minutes from Phuket Airport, it is possible to get there using the minibusses and vans that take passengers straight to their hotels or the city center. Patong has all types of accommodation. Patong is one of the best beach towns to stay in Phuket, especially for those looking for the best nightlife in southern Thailand. Lub d Phuket Patong is located a few steps from Patong Beach and the leisure center of Bangla and offers private and shared rooms with air conditioning. This stylish hostel features an outdoor pool. – from US$36. S.A.M Amber Hotel offers accommodation in Patong (Phuket). Breakfast is served in the mornings and there is a bar, a mini-golf course, and Thai massages. – from US$8. Thai Siam Hotel is an 8-minute walk from Patong Beach and features a rooftop pool with city views, a bar, and free WiFi. The rooms are equipped with private balcony. – from US$15. Diamond Cliff Resort & Spa is located on an 8-hectare estate with beautiful gardens on top of Patong. Overlooking the Andaman Sea and Kalim Beach, the property has 3 restaurants, 3 bars and 2 swimming pools. – from US$85. 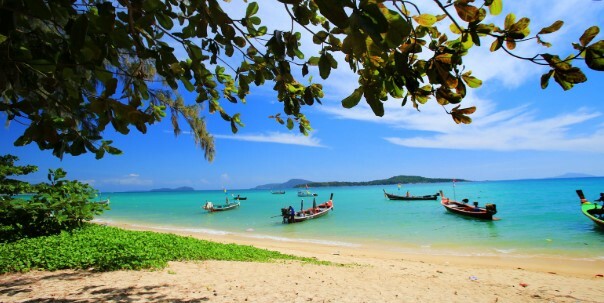 Rawai Beach is located in the south of the island of Phuket, not far from Phuket Town. Rawai is known for its beautiful sunsets and its proximity to Cape Promthep, a spiritual place located on a rocky hill. Rawai Beach is not considered suitable for swimming at its western end. Its eastern part houses the best restaurants specialized in seafood. Rawai Beach is appreciated for its pier and its ferry connections. Rawai Beach is a long and narrow beach ideal to walk on foot and taste delicacies at the seafood market. 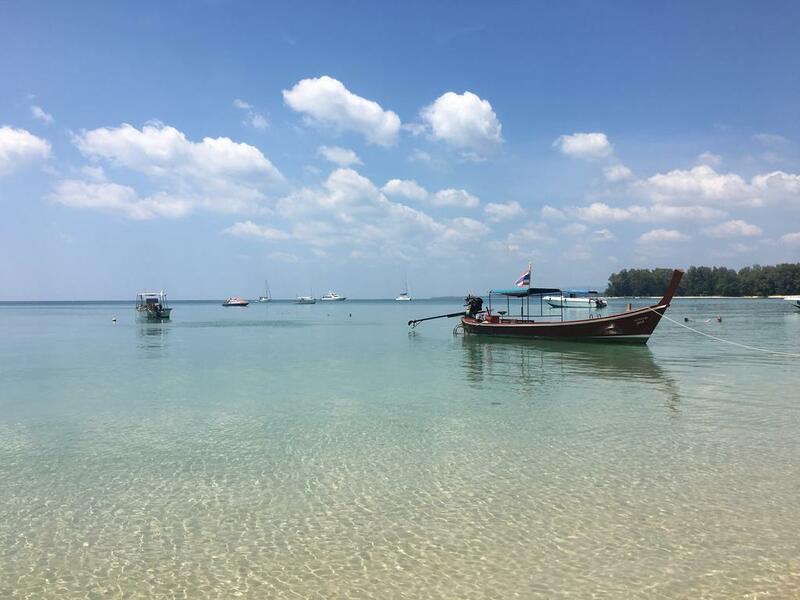 Most visitors choose Rawai Beach to stay in Phuket not because of the beach itself, but because of how easy it is to get around Phuket and the nearby islands (including Phi Phi). The Title Beach Front is a 1-minute walk from Rawai Beach. It offers spacious apartments and features an outdoor pool and sauna. – from US$57. Bang Tao Beach is located to the west of the island of Phuket. Long and wide, Bang Tao offers white sand and calm turquoise waters. Bang Tao is one of the most paradisiacal beaches in Thailand. Bang Tao Beach is half an hour away from Phuket Airport, from where you can a taxi. Its beachfront offers luxury hotels, a golf course, a shopping center and many interesting places to eat and have a good time. 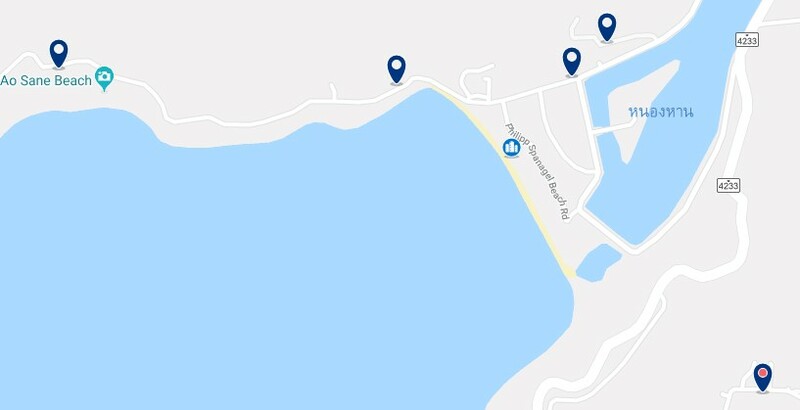 To move internally in Bang Tao Beach, you can catch a free shuttle bus on the beach. To leave Bang Tao and go to other areas on the island, you have to rent a scooter or take a taxi. Bang Tao Beach is a great area to stay in Phuket. It has luxury hotels, its beach has all services, including bars and restaurants. It also offers cordoned bathing areas. Laguna Holiday Club Phuket Resort is located on Bang Tao Beach, it offers spacious accommodation with a kitchen, dining area and balcony with views of the golf course, the pool or the lagoon. Guests can access the beach. – from US$63. Nai Harn Beach is another famous beach in Phuket. It is popular for its immaculate white sand. It is located in the south of Phuket, camouflaged between green hills and small islands. Nai Harn Beach is flooded not only with water and sand, but with enough restaurants, hotels, and shops to spend a spectacular vacation. Nai Harn Beach is a large bay, it has fine, soft sand and clear water. It offers a large beach with a wide area for sailboats and luxury yachts. 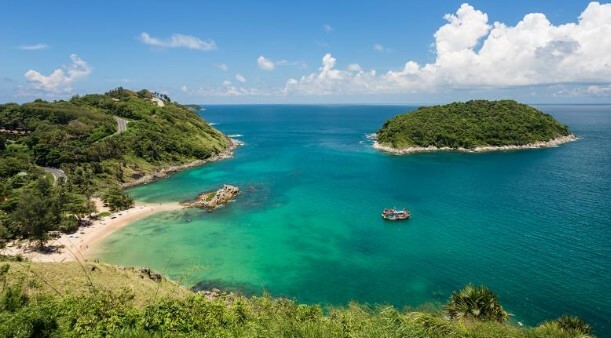 Nai Harn offers excellent service with massages, exotic fruits and walks around the bay, but lacks an extensive hotel offer on the beach itself. You can get great views of Harn Beach from the Windmill lookout or get on a rowboat on the famous lake behind the beach. All Seasons Naiharn Phuket is a 1-minute walk from Naiharn Beach and provides accommodation with views of the garden or the ocean. It offers 2 outdoor swimming pools and 5 places to eat and drink. – from US$39. 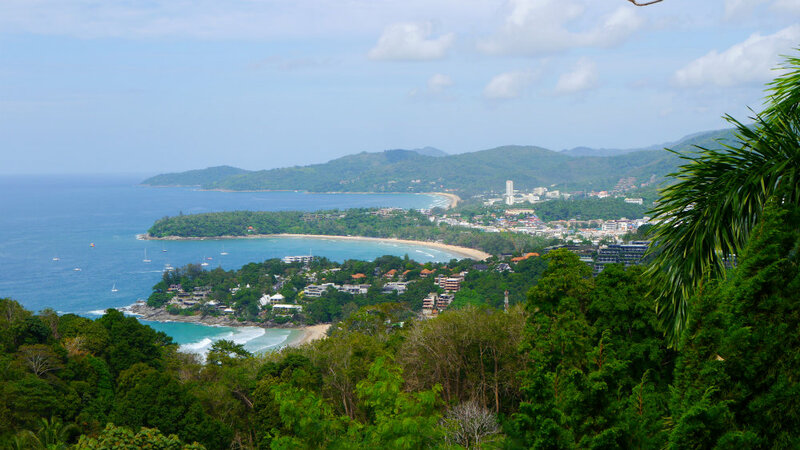 Karon Beach is located in the southwest of the island of Phuket. Karon Beach is one of the most developed tourist areas on the island. It has the second largest urban beach in Phuket. Karon Beach enjoys a good stretch of white sand, enough restaurants, and lively nightlife. Its clean, transparent and warm waters, its nearby coral reefs and its wide pathway for pedestrians and cyclists make it one of the most recommended places to stay in Phuket. Karon Beach can be reached by a bus service that takes almost an hour from Phuket Airport, by taxi or by renting a motorbike. Karon Beach is one of the best beach resorts to stay in Phuket. Woraburi Phuket Resort & Spa is located on the beachfront and features a Thai architectural style. It offers splendid views of the sea and the landscape and free WiFi and parking. – from US$42. Kata Beach is the most popular beach in Phuket, after Patong. Its waters are flanked by hills. It also has a picturesque island right in the center of the bay. As Kata Beach offers clear blue and calm waters, it is especially popular among families who come here to enjoy the warm and serene environment. Kata is also a very commercial beach. Here you can find souvenir shops, clothes, music, and massages, as well as a variety of restaurants with a variety of typical seafood dishes. From the airport, you can get to Kata Beach by minibus, taxi or rent a car. From Phuket Town you can reach it in a small open-air bus. To move around the beach, tuk-tuks are available for rent in front of the various hotels. The Yama Resort & Spa Kata Beach offers an outdoor pool and a fitness center, and is a 5-minute drive from Kata Beach. It offers a bar, restaurant, free Wi-Fi and free shuttle service to the beach. – from US$37. Surin Beach is considered one of the most beautiful on the island of Phuket. It is known for its crystal-clear waters, white sand, and tall bushes. Its calm waters make it great for swimming in high season. During the monsoon months, however, waters can be turbulent. In Surin Beach, you will find small Thai restaurants, modern beach clubs and many palm trees bringing the touch of color and exoticism mandatory during a holiday in Thailand. Surin Beach is about half an hour from Phuket Town, you can get there by bus or taxi. It also offers tuk-tuks and motorbike rentals. Among attractive luxury resorts, there are shops specializing in massages and some fashion stores. Surin Beach Resort is located in front of Surin Beach, in the province of Phuket, it offers an outdoor pool and a sun terrace overlooking the beach. Free WiFi is available in all areas. – from US$49. 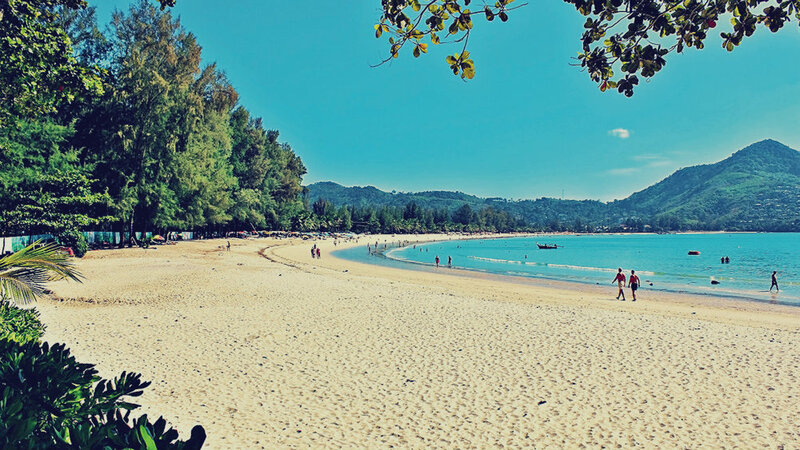 Kamala Beach offers a bustling lifestyle during the high season. It is one of the cheapest beaches to stay in Phuket thanks to its wealth of budget accommodation and backpacker options. Kamala, in addition to its beach, is a popular destination because of Phuket Fantasea, a circus-like show including acrobatic dancers and elephants, part of a two-decade-old theme park. 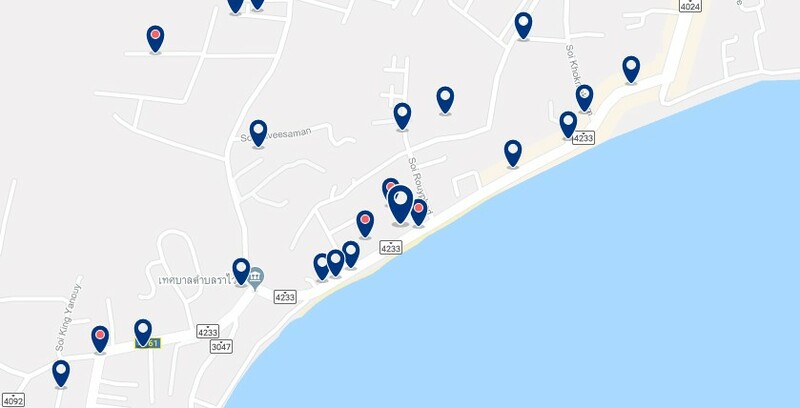 Kamala Beach has a variety of restaurants, small bars, a Buddhist temple on the south end of the beach and several mosques in its residential areas. Moving around Kamala Beach is easy thanks to its blue songthaews, local bus-like public transport. To get to or from Phuket Town, the airport or Patong beach, it is recommended to use the taxi or tuk-tuk. Thavorn Beach Village Resort & Spa overlooks the sea and offers bungalows distributed around an area of 10 hectares of tropical vegetation. It also has a large pool and a fitness center. – from US$84. Sabina Guesthouse is a 5-minute walk from Kamala Beach. It offers free Wi-Fi, free parking and rooms with air conditioning and TV. – from US$14. Nai Yang Beach is a wide beach located ten minutes from the airport, northwest of Phuket Town. It has more turbulent waters than those found more to the south of the island. Nai Yang is surrounded by abundant vegetation and native fauna. Although Nai Yang Beach is not as well-known, it is popular for Kite Surfing and other related activities, it also offers shops, markets and entertainment places. Nai Yang Beach is pleasant, shady and full of small bars and restaurants, many of which are lined on the street or right on the beach. Nai Yang Beach can be reached from Phuket Town by minibus or taxi, or by bus from the terminal next to the airport. Naiyang Boutique Resort is surrounded by lively cafes and bars, just a 10-minute walk from Naiyang Beach. It offers free Wi-Fi and parking. – from US$24.